Both a biography of Hitler's Deputy, Rudolf Hess, and an investigation into the mysteries surrounding his peace mission to Great Britain in May 1941, based on exhaustive archival research in Britain and Germany. Concludes that Churchill was privy to a plot by the Special Operations Executive to convince Hitler that a 'peace party' existed in Britain prepared to oust Churchill and sign a compromise peace with Hitler. Hess came over as Hitler's plenipotentiary. "...The first half [of the book] contains one of the clearest accounts I have ever read as to how a group of pathological misfits took control of one of the great countries of the world. 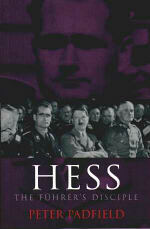 Hess now tends to be dismissed as a fantasist and dreamer at best, a near lunatic at worst. 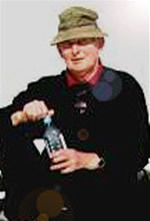 Padfield shows unequivocally that he was a central figure in the Nazi move to power, indeed going as far as implying that much of the philosophy (if so it can be called) behind Mein Kampf was not Hitler's but Hess'." "A good biography like this one is often as rewarding a book to read as a good novel. The flight of Rudolf Hess...to Scotland in May 1941 remains one of the great unsolved mysteries of the second world war...it makes fascinating reading."